As the weather warms up in Ohio, many of us will be outside sprucing up our yards. Our animals generally love to be outside in this nice weather as well, and some will even help us with the yard work! This may be dangerous in some circumstances, and there are some things we should watch for to keep our furry friends safe. One danger is not just in our own yards, but in the neighbors’ as well, and one you must be mindful of when walking your animals. Lawn chemicals can be dangerous to pets, causing paw irritation and other problems. Cats especially may be more sensitive to these chemicals, partially because of their grooming habits. 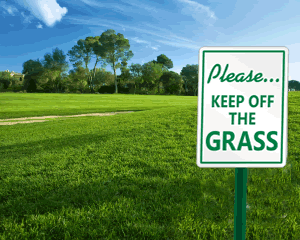 If you treat your own lawn, keep pets away from the area for 24 – 48 hours if possible. If it’s not avoidable, wash off paws and bellies well after being in the treated area. Lawn mowers are also a danger for our pets. Keep pets confined or in the house to avoid any mishaps. Other dangers outside include treated wood and nails from new projects, mulch and grills. Treated wood contains toxins that are harmful if ingested. Dogs sometimes find nails and screws amusing and might try to play with them, causing avoidable wounds. Mulch can taste very good to our furry friends but is very toxic and can cause impactions and blockages. Grills and BBQs can be hazardous as well. Dogs and cats sometimes cannot resist the delicious smells of your cooking and may become burned if left unattended. Make sure to clean out the ash pan and drippings, as these can make animals very sick. Paying attention to these dangers as well as others will help keep your pets safe as temperatures warm up!